Russian President Vladimir speaks during his annual news conference in Moscow, Russia, Dec. 20, 2018. Russian President Vladimir Putin expressed support for a surprise White House decision to pull 2,000 U.S. troops out of Syria, calling their presence there illegitimate and an impediment to peace in the region. Addressing a record 1,700 journalists at his 14th annual end-of-year marathon press conference Thursday, Putin said he agreed with President Donald Trump’s assessment that Islamic State had largely been defeated on the ground in Syria. “Donald is right, I agree with him [about that],” he said, stating that radical militants still holding small parts of northern Syria had suffered at least a “serious blow” over the past year. The U.S. has justified its military presence in Syria to combat the Islamic State as part of its global war on terrorism. Putin then expressed skepticism about whether the U.S. withdrawal from Syria will actually happen. On Wednesday, Russian state media outlets reported that Russia’s Foreign Ministry called a prospective U.S. withdrawal auspicious for a political settlement of the 7-year-old crisis. The ministry also said an initiative to form a Syrian constitutional committee had better prospects for success without a U.S. presence in the region. The Kremlin’s reception of Wednesday’s White House announcement provided rhetorical ammunition to U.S. critics of Trump’s decision, which even a few of Trump’s congressional allies called chaotic and misguided. Senate Armed Services Committee member Lindsey Graham of South Carolina commented on the announcement on Twitter. “I found someone who is supportive of the decision to retreat from #Syria,” tweeted Florida Republican Sen. Marco Rubio in a post that linked to a Russian embassy statement of support for Trump’s decision. Some Moscow-based military experts, however, aren’t so sure that a U.S. military withdrawal immediately benefits Russia. “I think Putin must be satisfied, and maybe — maybe, but I wouldn’t insist — in the future, he will commend this event as a victory for Russia, perhaps,” said Alexey Malashenko of the Moscow-based Dialogue of Civilizations Research Institute. 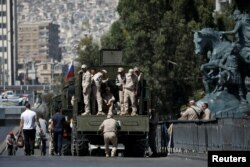 FILE - Russian soldiers stand on a truck in central Damascus, Syria, Sept. 14, 2018. For years, Malashenko said, Kremlin officials have taken to Russia’s tightly controlled domestic news media platforms to demonize American military aggression in the region, describing it as a necessary justification for Russia’s own military presence. “For Putin, I believe, the American existence on Syrian territory was somehow comfortable or maybe convenient, but now he must replace or change his explanation for Russia’s role there,” he said. “I can’t be sure, because I’m not a close observer of Trump, but I believe that some part of the American military will stay. We know this from the recent examples in Afghanistan, in Iraq, and so on,” Malashenko added. When asked if a U.S. military withdrawal from Syria would pose a significant domestic political victory for Putin, whose approval ratings are at a historic low, he was skeptical. Andrey Kortunov, director of the Russian International Affairs Council, said reduced prospects for inadvertent clashes between U.S. and Russian troops is by itself a reason for Putin to sleep better, and that U.S. withdrawal is an overall net gain for the Kremlin. 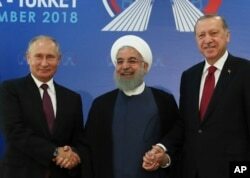 “Putin can be satisfied because the fewer players there are, the easier it is to cut deals … and, in terms of the Kurds, Russia might be in a position to restore that relationship, which broke when Putin opted to forge an alliance with Erdogan,” he said, referring to the president of Turkey. U.S. troops in Syria have been working closely with an alliance of Kurdish and Arab militias known as the Syrian Democratic Forces (SDF), which Turkey believes is tied to Kurdish militants within its own borders and has threatened to attack. The White House denied that Erdogan influenced Trump’s decision to withdraw, and SDF fighters issued a statement rejecting White House claims that the Islamic State has been defeated. “Eyebrows were already raised Tuesday evening, however, when the State Department announced the U.S. is prepared to sell over 100 Patriot air defense missiles and radar systems to Turkey for $3.5 billion,” wrote McLeary, who reported that the deal, if approved by Congress, could scuttle Turkish plans to acquire a Russian-made air defense system, a move U.S. and NATO officials have criticized. Kortunov of the Russian International Affairs Council, said the U.S. withdrawal could also have unforeseen geopolitical consequences for U.S.-Russian relations. Asked if the American presence in Syria is required to justify Putin’s rationale for keeping forces on the ground there, Kortunov balked. “That’s a bit far-fetched in my opinion,” he said. “I don’t think Putin really needs these justifications. Military analysts say up to 30,000 IS militants remain active in Iraq and Syria and that Trump’s decision appears to have been made without the support or knowledge of top Pentagon officials.